French architect and one of the most eminent French scholars of his time. He received his doctorate in physics and medicine from the University of Paris and became one of the first members of the Acadmie des Sciences , founded in 1666. He advanced the study of anatomy and wrote on physics and zoology, as well as contributing several scientific inventions. He was also a celebrated architect. His greatest achievement in this field was the Colonnade on the east facade of the Louvre (1667-70). He also built parts of the south facade and the Paris Observatory (1667-72). 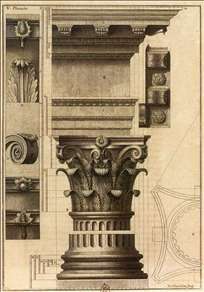 Aside from his influential architecture, Perrault is best regarded for his translation of the ten books of Vitruvius, the only surviving Roman work on architecture, into French, done at the instigation of Colbert, and published, with Perrault s annotations, in 1673. In 1683 he published a treatise on the five orders of columns in architecture. It was published by Daumont, Rue St Martin, Paris. See more details about "Classification of the Five Orders of Columns"